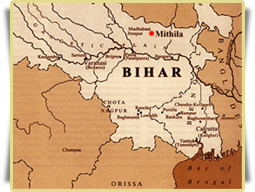 Mithila was a large and powerful ancient kingdom in what is now north-eastern India and southern Terai region of Nepal. One of the most powerful capitals of eastern India in ancient times the region is a vast plain reaching out in the north towards the Terai region bordering Nepal, caressing the shores of Ganges to the south and stretching out in the west towards Bengal. In the mid-sixties, this region underwent a bilstering drought and its inhabitants faced widespread starvation. In 1965, an aid worker for the Indian government, Bhaskar Kulkarni, arrived from Delhi and encouraged the idea of translating these traditional wall paintings onto paper. 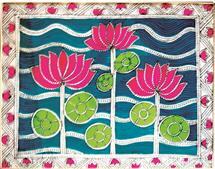 Materials like Paper and colours were supplied to these artists free and the resulting work was sold through government handicraft shops all over the country. 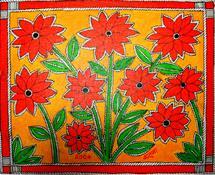 As a result these works became famous as "Madhubani Paintings". Women of the region still paint on the walls and floors of their houses, but many of them (and now a days, sometimes men too!) paint on paper, enabling their art to be sold around the world. 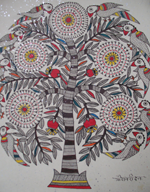 It is because of their desire to please their gods and to develop their spirituality that brought in Madhubani Painting. Like almost all other folklore around the world, these paintings too have elements of myth and have tales revolving around the origin of the earth, life, existence of gods and supernatural beings like gandhavas, apsaras, and stories based morals. Additionally they have assimilated the themes from Hinduism, Budhism on a common tantric foundation. For weddings and festivals, they embellish the outer walls of their homes with elaborate drawings based on familiar mythological stories. The walls of the wedding chamber (Kohbar Ghar) were adorned with symbolic paintings symbolizing fertility and life. Sita Devi, a Mahapatra Brahmin, was the pioneer in developing the Bharni style of colour painting. 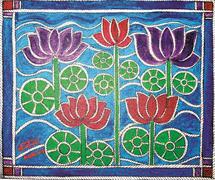 The Bharni style of painting lavishly deals with rich variety of colours. Their easy access to Hindu sacred literature like Ramayana and Mahabharata helped them immensely in portraying the rich Hindu iconography and mythology. All artists of that time could orally recite the whole epic. This style is locally known as Bharni, which means afilling. The Bharni style of painting is bold and colourful, with rich line work around the coloured forms. The exposure of Brahmin painters to rich Hindu iconography and mythology helped them to develop forms and subjects very easily. The common subjects were Vishnu, Kaali, Durga, Shri Krishna and all other gods and goddesses. Sita Devi hailed from Jitwarpur village of Madhubani district. Apart from drawing traditional Kohbar paintings she painted scenes from nature like lion in the jungle which is presently in collection of Craft Museum, New Delhi. Sita Devi was invited to paint the walls of Prime Minister Indira Grandhi's office at New Delhi. She was not only nationally recognized, she also travelled extensively in Europe and America and presented her works at various cultural fairs and exhibitions. After seeing Sita Devi's success many other Mahapatra Brahmin women from Jitwarpur and adjoining villages came forward to present their art. Among them Bauua Devi inherited her style quiet flawlessly. She is also one of the most dynamic painters in the history of Mithila paintings, who is known for her paintings on snakes. Her works are part of many prestigious museums in the world. In the beginning when Mithila paintings were being done on paper only a few Brahmin women took the opportunity to practice this art form. However, a decade later, some women from the Kayastha community, attracted by the name, fame and money the art brought with it, came forward with a new style, locally known as line paintings. 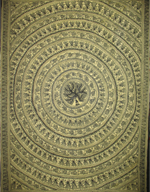 The unique feature of the Kayastha tradition was the use of monochrome or just two colours. 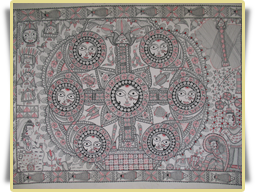 These paintings were also famous as Katchni paintings since all the forms which were drawn were filled with different types of rendering instead of filling colours. 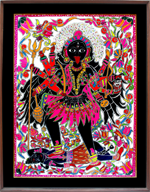 The pioneer of this style of painting was Ganga Devi from Raseedput village of Madhubani district. It evolved more in Ranti village of Madhubani district. In this style the subjects were more or less same and difference was in the way the whole paper was covered by different types of line work. The success of Brahmin and Kayastha women painters inspired women from the lower castes to paint. Mostly, all Dusadhs being landless, they survived on services they render to the upper. 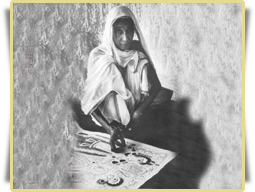 After seeing the success of higher caste women, and on the initiations of outsiders like Bhasker Kulkarni and German anthropologist Erica Moser, Dalit women could not resist their inner urge to supplement the household income and started painting on paper. Jamuna Devi, who belonged to the Chamar community of Jitwarpur village, was the first Dalit woman to enter the are of commercialized painting. She was pioneer of tattoo or 'Goidana' paintings. The Dusadh women took form from the tattoos on their body as they were not aware of the Hindu cosmology like the upper caste. Another reason could be the fear of upper caste as they began to draw on their vibrant folklore, retold through legends, songs and rituals associated with the Rahu, Sun, Moon and their legendary cultural hero – Raja Sailesh. Traditionally women and only women have been practicing this art form, as an expression of the civilization and environment around them. The original inspiration for Madhubani art emerged out of women's craving for religiousness and intense desire to be one with God. Their subjects had linkages with relationships with environment, life, religion & society, morality. Mithila is most celebrated, however, by the Ramayana, the most popular Indian epic. And one of the most popular paintings adorning village mud walls was the heads of the ideal couple Ram and Sita (Sita the daughter of King Janak of Mithila, was born here and is also known by the name Mythili). It is the women of Mithila who have contributed to keep alive the folk songs, folk tales, folk-arts and folk crafts in this region. Therefore these women folk have played a pivotal role in keeping alive this old tradition of rural life, passing down the values and culture of the society. For over 3,000 years, these women of Mithila have taught their daughters with enthusiasm this unique style of painting on the mud walls and floors inside their homes. The traditional women painters lived in a closed society. The introduction of paper, and the sudden exposure of this art to the world has moved the locus of the artists' efforts out of the home and removed the creation of this art from its ritual setting. Despite the persistence of traditional themes, the change to paper has also allowed the artists to experiment with newer themes, and allowed them a broader freedom of expression. Today it is not unusual to see contemporary social themes and current events incorporated into the Mithila painters' work. Ganga Devi, Mahasundari Devi and Bani Devi are some of the prominent women artists who fully exploited the use of paper and used it to express their feelings that they had otherwise suppressed for so long. Having been born in this region we too have had a deep exposure to this art form since childhood from our Grandmother Smt. Phoolmaya Devi, and out Mother Smt. Manju Jha. Coupled with the good fortune of an urban education and formal training in architecture has given us an insight to experiment with newer contemporary themes relevant to our society today.